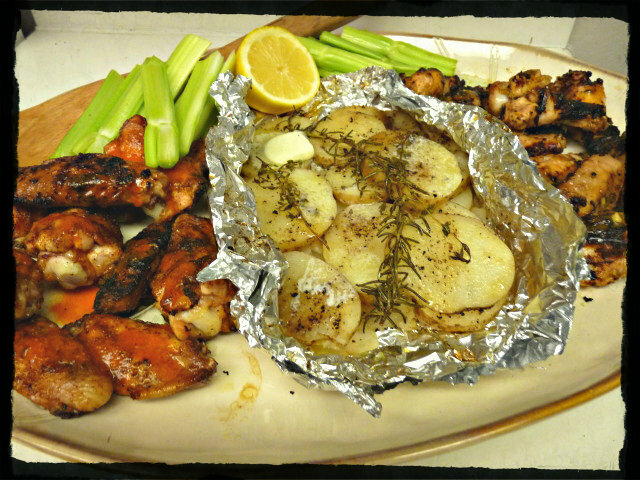 While recently reviewing my recipe page, I was shocked to see that somehow I had never included Buffalo Chicken Wings! The ones that got it all started! Sure, I had covered wings before. 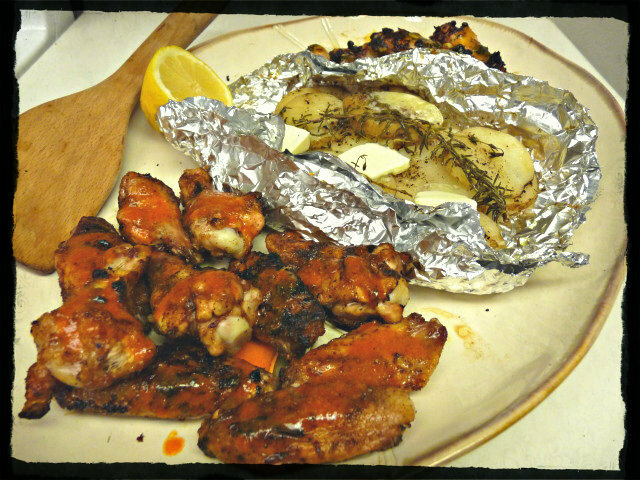 There were the Australian Beer-Barbecued Wings, the Chipolte Chicken Wings, Jamaican Jerk Wings, Spicy Ginger Teriyaki Wings and last, but not least, Mrs. G’s favorite…Piri-piri Chicken Wings. If you haven’t noticed…I kinda like wings. Mrs. G says its my 5th food group. But to not have included the original recipe? I’m a bit embarrassed, to tell you the truth. So now, without further ado….here are our version of Buffalo Chicken Wings. 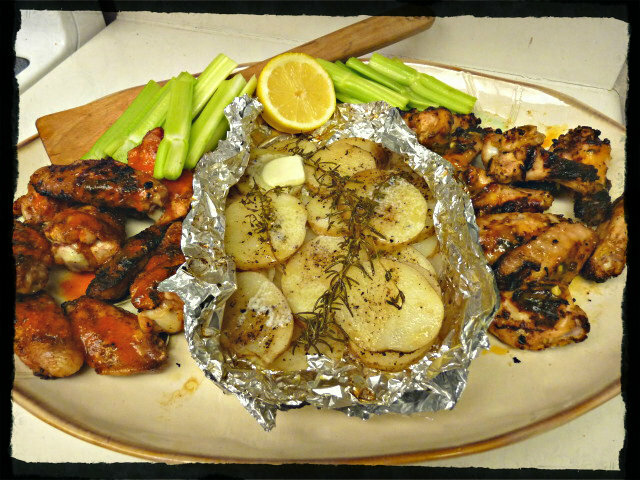 Mix of Buffalo Wings (left), Piri-piri wings (right) and some taters. Mix ingredients in a saucepan. Heat on high till boiling, then reduce to simmer, stirring often. Continue to simmer for about 5 minutes. 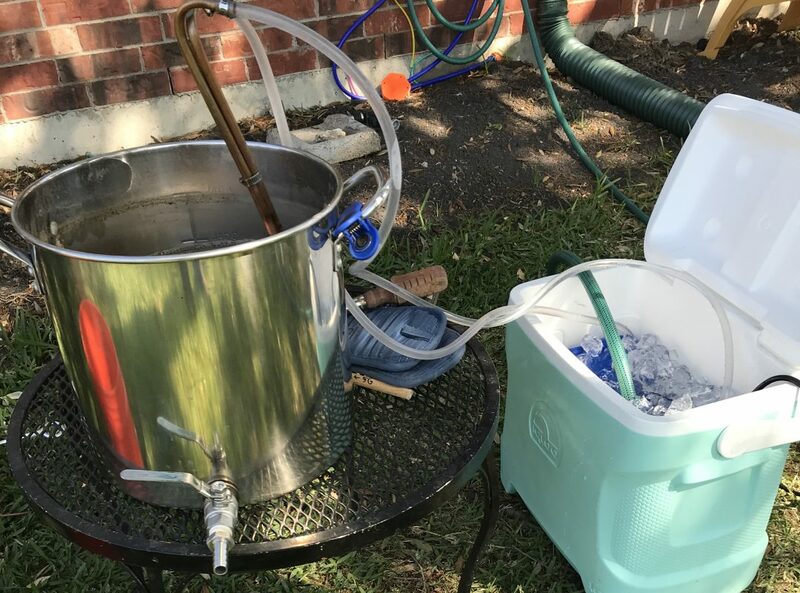 Set aside while grilling the wings. Here’s a tip I picked up a few years back and would like to share it with you. Do you like your wings crispy? (and who doesn’t) But you don’t want to fry them for whatever reason. Then take you wings out of the package, rinse them off and dry them and then allow them to air dry in your refrigerator for as long as possible. Just put them on a plate. Do NOT cover them. If you can, flip them about halfway through, but this is not necessary. I like to do this the morning that I am going to cook them. They can be dried overnight. Even a few hours will help them to crisp up when you cook them. 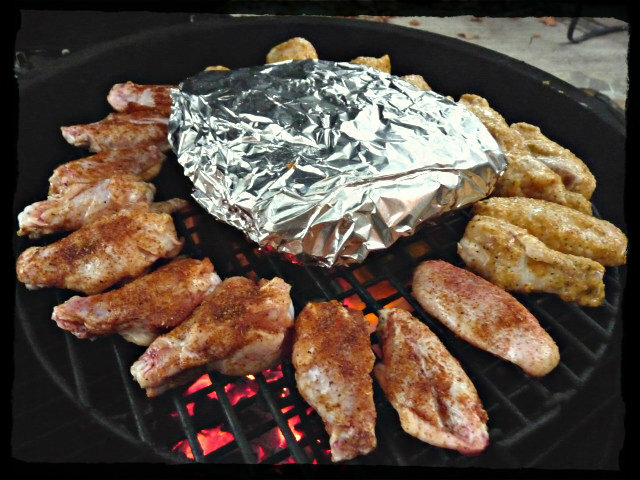 Once you are ready to grill the wings, rub them down with your favorite bbq rub. If you like your wings hot, go with a hot rub, or mix some cayenne pepper in with you rub. For these ones, I rubbed them down with Dizzy Pig’s Jamaican Firewalk, which they describe as “Based on island jerk, Jamaican Firewalk has a hefty kick of heat rounded out by a citrussy tang and just a hint of the powerful and often overused Jamaican Allspice berries. This is a spicy rub!” One of my favorite rubs to use with wings. There are many ways to grill wings, so you are going to have to set up your grill accordingly. If using a gas or charcoal grill, set it up for two heat zones. One side you are going to want about medium heat (around 400-450) and then a zone with no heat where you can move the wings in case of flare ups (which you will more than like have). If using a Big Green Egg or other kamado style grill, set up your grill around the 400-450 range. 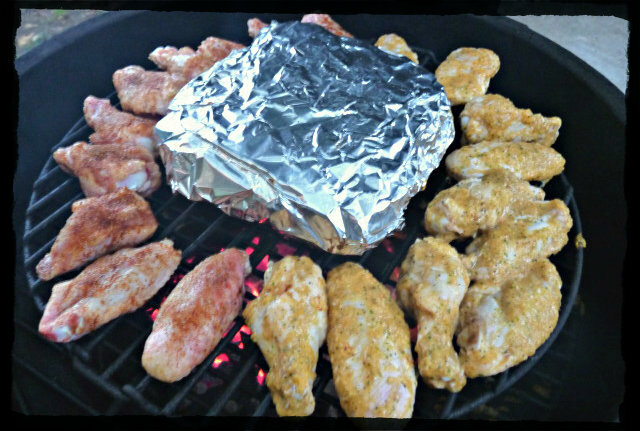 You are going to want some way to elevate your grate in order to raise the wings higher above the charcoal. Here I am using the Big Green Egg grate extender (which I don’t recommend), but the Adjustable Rig from Ceramic Grill Store, the swing grate from CeramicGrillWorks or any home built version you can come out with will work just as well. Just elevate it to about the rim of the bottom of your grill. For smoke, I went with a mixture of pecan chunks and applewood chips just because that was what I had on hand. 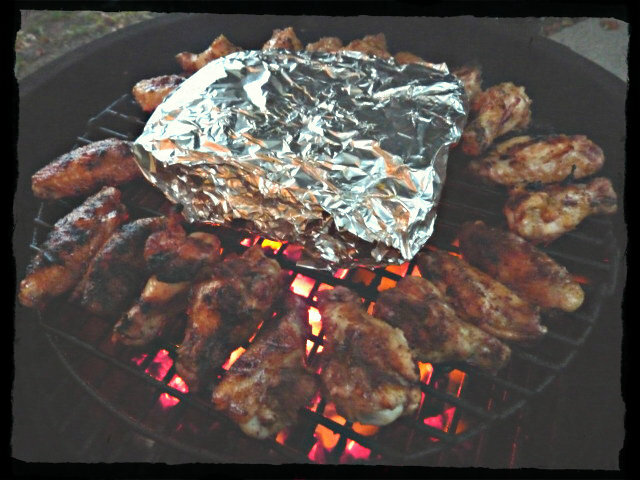 Generally, I find wings take around 30 minutes, depending on how hot your grill is (These wings took about 25 minutes). You are going to want to check them occasionally to see if they need to be flipped or rotated if you have hot spots on your grill. I usually start checking the temperature of my wings after 20 minutes. Chicken is considered safe at 165F, but I usually like to take my wings a little bit higher in order to crisp up the skin. These were pulled at 175. Once your wings are done, you can either toss them in a bowl to coat with the sauce you made earlier or drizzle some on top depending on how messy you like you wings. I say the messier the better. Serve them up with some Bleu Cheese or Ranch dressing and some celery sticks and carrot sticks and you are ready to watch the game. Or whatever else you feel like watching. Enjoy! These look super-yum, Jason! I like the tip re: drying them for crispier results. I saw a video of a chef preparing to roast a whole chicken. To make the skin crispier he set the raw bird upright on the counter and pointed a box fan on it to dry out the skin. Your method seems better, as i thoought he might be pushing food safety a little to far. Interesting, but yeah….that doesn’t seem very sanitary or safe. I’ll stick to my way. Thanks for the tips! I have always been intimidated to make these. Yours look so good! Nothing to be intimidated by. Super easy. If you are doing them in the oven, you might want to drop the temp down to 350F and adjust the times accordingly. You’ll be shooting for an internal temp of 165. Let me know how they turn out for you when you decide to make them. I’m sorry I don’t have anything new to post, but Jason from Texas did some awesome looking Buffalo Wings on his Big Green Egg, so I thought I would share those with you!